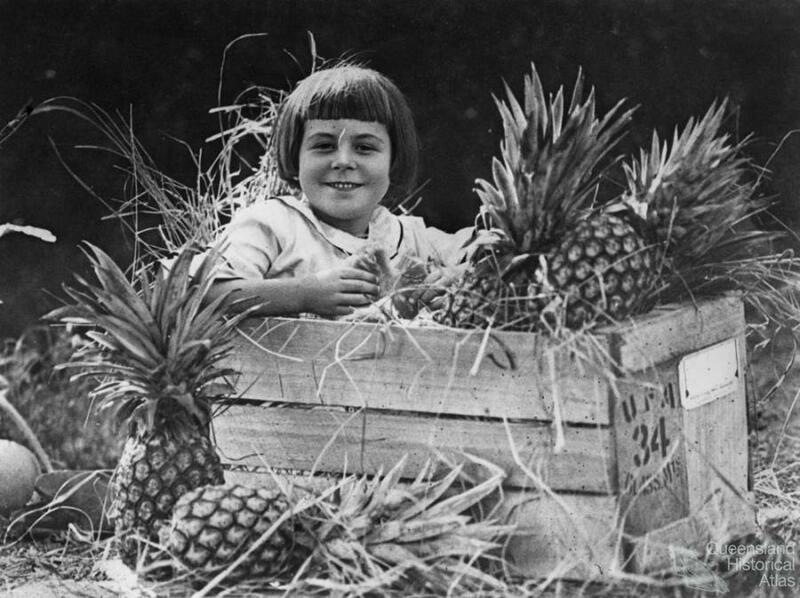 Sometime in 1924 in London, a little girl, of no more than five years old, I fancy, sat down in a crate of Queensland pineapples and smiled. 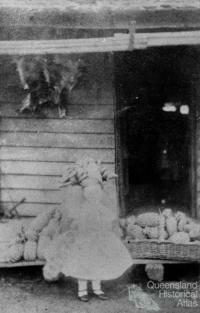 Her legs were tucked up under the largest and spikiest of all pineapple specimens, and she held a slice in her hand. 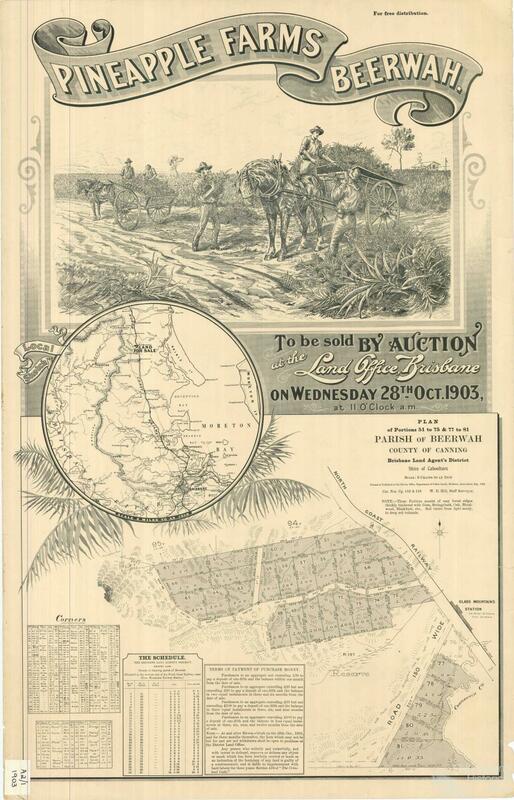 The occasion was a Queensland fruit promotion at the Empire Exhibition at Wembley. King George V opened the exhibit, and vast numbers of visitors took part—millions, records say, through the turnstiles. Imagine this little girl for a moment, the centrepiece and finishing touch to a display of canned food and condiments in the Australian Pavilion. Imagine her discomfort sitting amongst all those pineapples and in such a confined space, too, the tickle and scratch of straw, the tease of sticky pineapple juice through her fingers. Don’t move! Hold it like that! Keep that smile, that’s good! Not to mention the pineapple crown, spiky at her elbow, and the thorny Fibonacci sequence skin-to-skin against her knee. For how long did she pose? How many people spotted her in box 34 to exchange looks? Was the pineapple in her hand worth the wait? Was she rewarded with a glass of punch for morning tea, or a slice of upside down cake to take home? 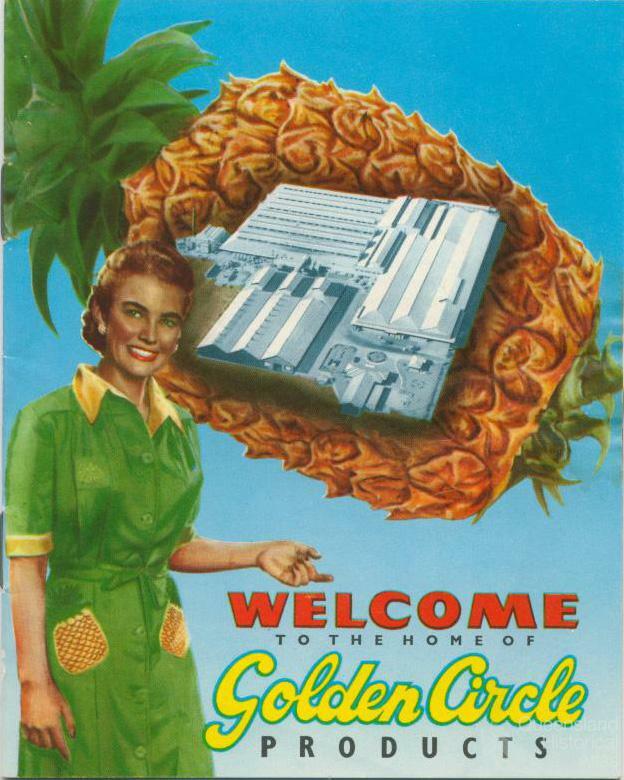 I first met this ‘pineapple girl’ on the front counter of the National Library of Australia in Canberra, as a PictureAustralia postcard. Pineapple Girl places me firmly in the landscape in which I grew up—Queensland up the nose and in the pores and cracks of my skin. Holding her hand, metaphorically speaking, a strange transmutation takes place, something the writer John Carey might call ‘imagination-stirring’. 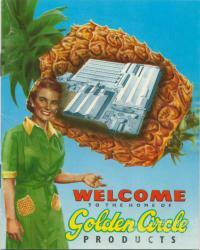 For when I think of pineapples I think of Queensland. What better catalyst to excite the imagination, to peel the senses than the peculiar complexities of this sorosis, this crowd of flowers, an object the great modernist American poet Wallace Stevens once referred to, in Someone puts a pineapple together, as ‘the sum of its complications, seen/And unseen’? 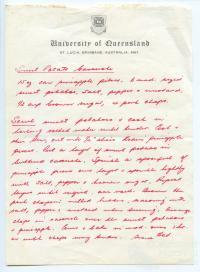 In 1947, the same year Wallace Stevens was writing his pineapple poem somewhere in Pennsylvania I imagine, a place known for its peaches, the Golden Circle cannery started production in Northgate on the outskirts of Brisbane, hauling in millions of ripe pineapples for processing: sliced, cubed or crushed. 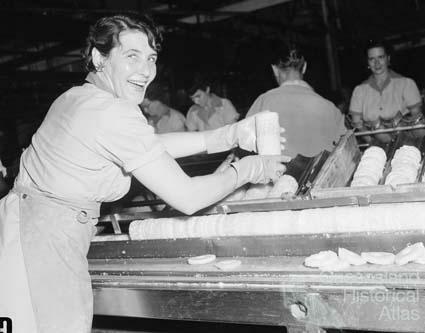 It was the same year, too, that the Queensland government sent the future Queen Elizabeth 500 cases of canned pineapple to celebrate the occasion of her marriage in London. 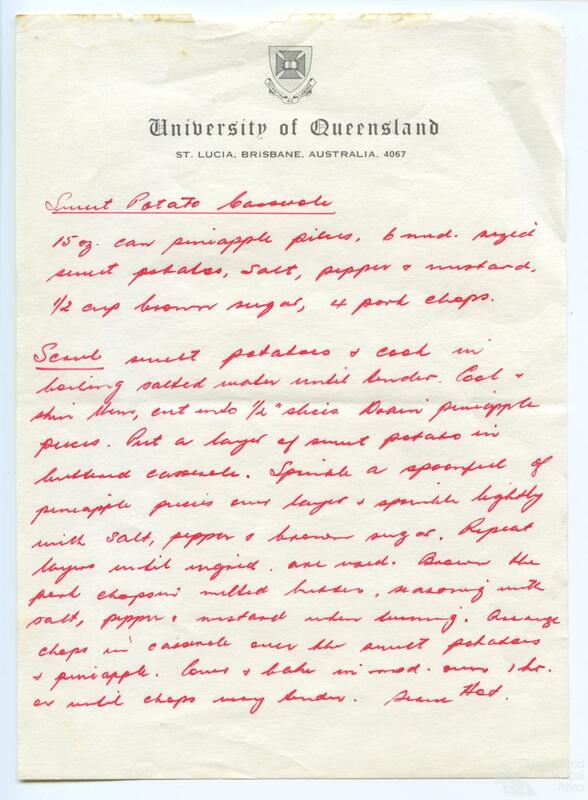 Did those handpicked Queensland pineapples end up in princess soufflés and palace flambeaus? 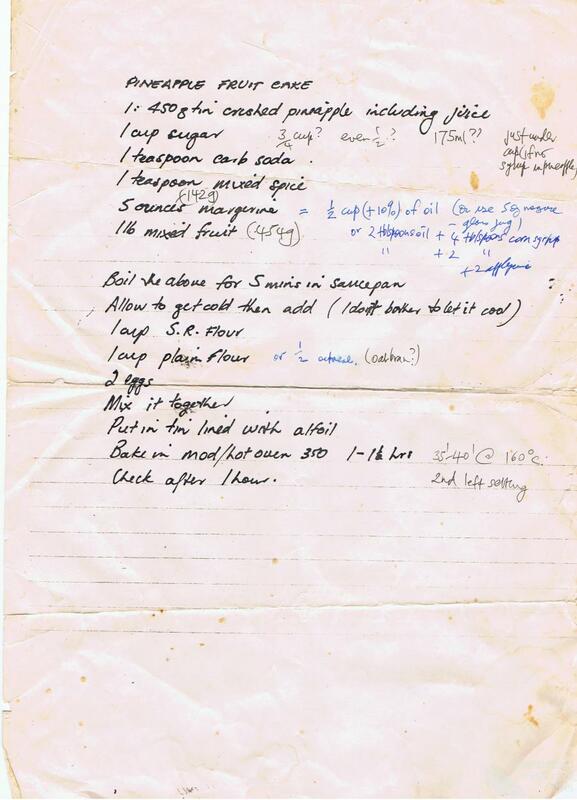 Did the Queen’s cook learn the pineapple do-se-do? 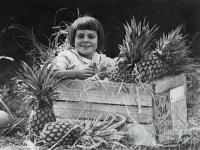 For one pineapple girl always leads to another; this original 1924 PictureAustralia girl leading me to all the other pineapple girls I have known and discovered. 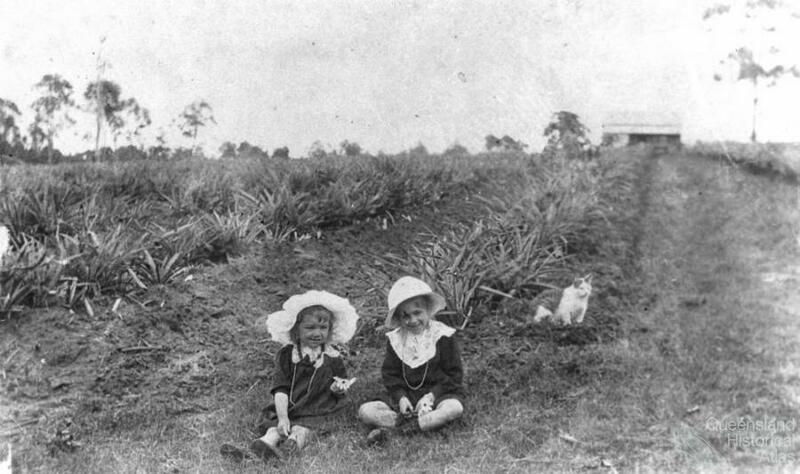 There’s Kath and Dulcie from Atthow’s pineapple farm at Lindum in Brisbane; the littlest of all Pineapple Girls hiding as ‘a charming study’ in the land of sunshine; ‘country beauty’ Bronwyn Moorehouse posing among the ripe pineapples on her father’s plantation in the Maroochy district on the Sunshine Coast; and Dutch-born Mrs E Buikstra, of Stavoren, Friesland, checking slices of pineapple for faults at the famous Northgate—with a smile. 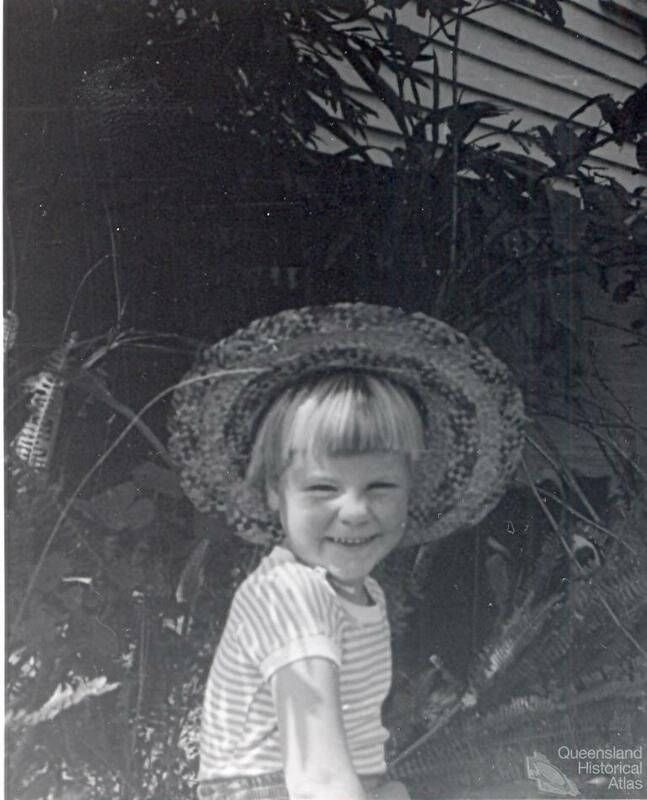 Pineapple Girl takes me back to my own childhood, too, to the smell of my own Queensland through my hair and up the nose, here, tucked into the frangipani corner in St Lucia, in a photograph my father took when I was four or five years old. 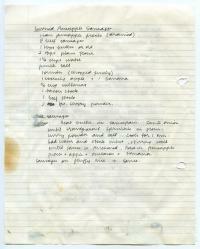 I fancy pineapple excess on my tongue, the taste of warmth and fecundity: possibility. 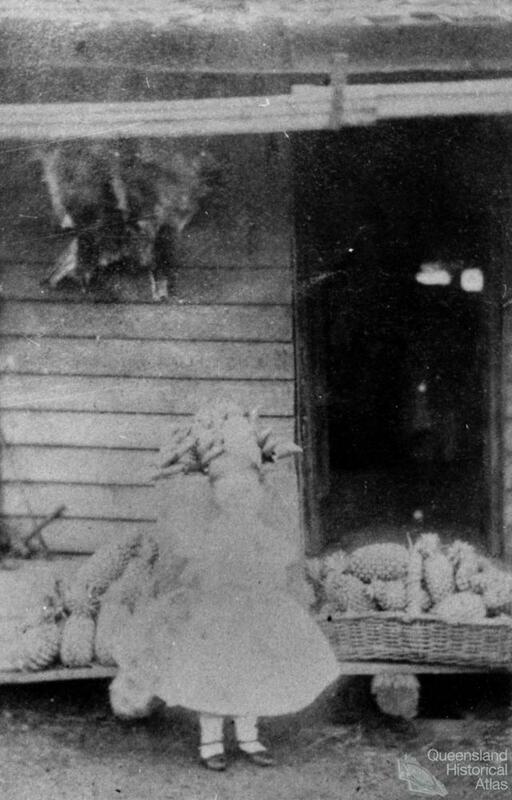 You can imagine this Pineapple Girl in an agricultural display too, can’t you? She’s got the right smile. A perfect fringe. She takes me back to the sickly stench of pineapple juice stuck in my sister’s hair long after shifts in the cannery, to tales of excoriated skin and the sting of cuts. 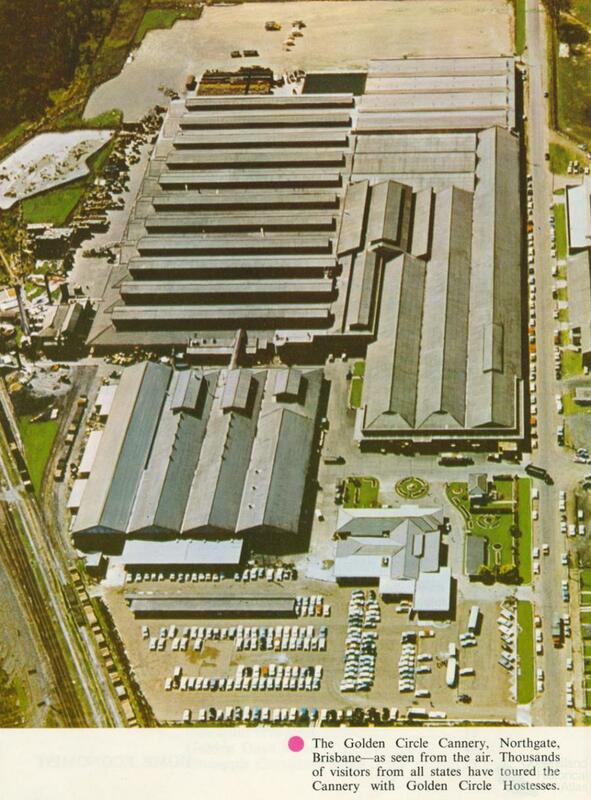 To disbelief, that the punch my mother offered guests at Christian barbeques on Saturday evenings was the same pineapple juice swept off the cannery concrete floor and ladled into two-gallon tins to sell. So my sister says. Stories seen and unseen. Complications. In my family, we ate pineapples with everything. 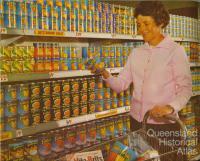 Each week my mother would load up two supermarket trolleys with all sorts of pineapple products from the Golden Circle range. 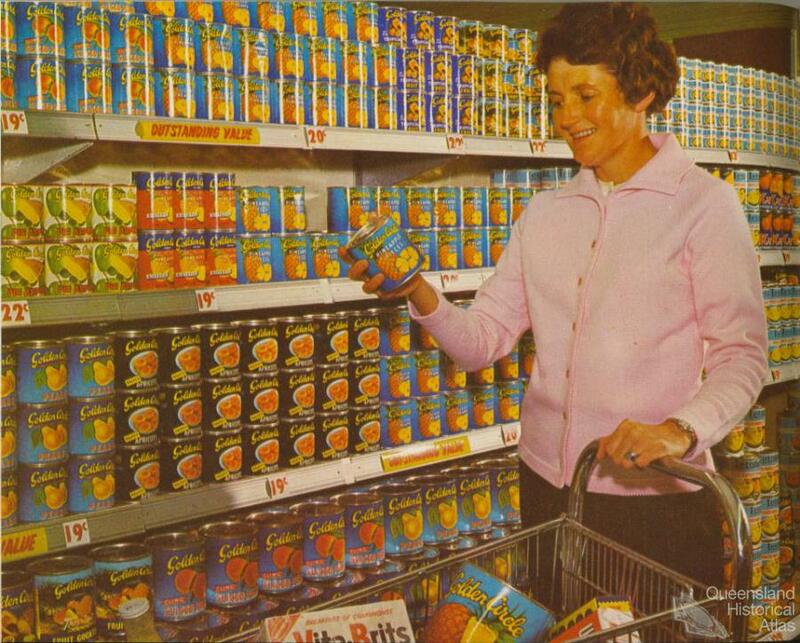 At home, I would rearrange the tins into giant displays, just as farmers might arrange exhibits in the Fruit Hall at the annual Brisbane Ekka. 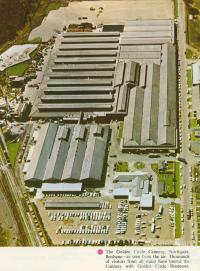 I fancied I could win first prize. 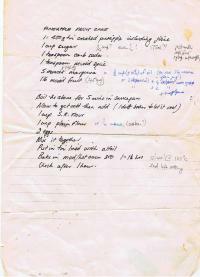 As I write, pineapples leading the dance, I think about recipes my mother gave me, recipes copied in copybook writing into my own loose-leaf books for safekeeping, recipes I remember making as a young woman at university: sweet potato casserole, curried pineapple sausages (always Keen’s), and the pineapple fruitcake said to come from a Golden Circle test kitchen. 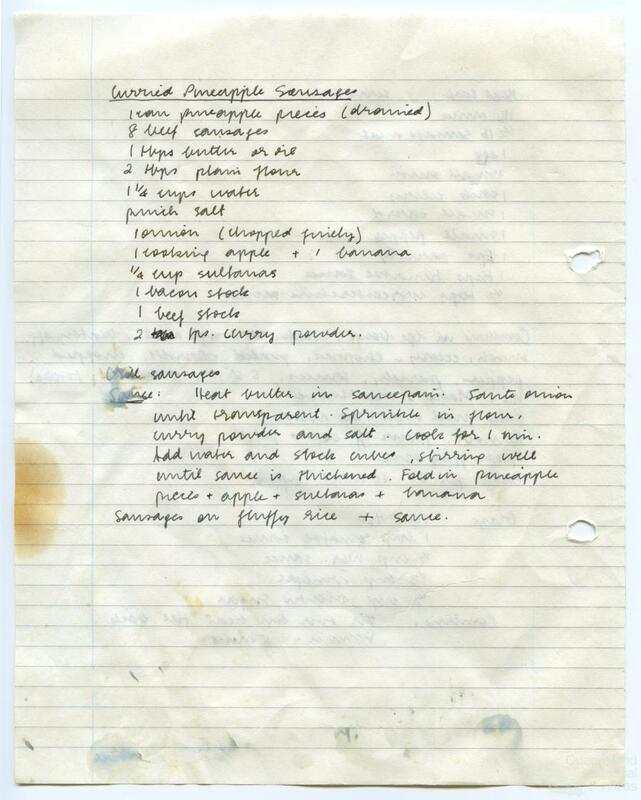 These recipes were shared between mothers and handed down to children like trusted relatives, each iteration with its own set of annotations and baking memories—squealing to be the first to lick the mixing bowl, the pleasures of oven-hot puddings, and sweet lashings of pineapple cream down the throat. Australian writer Cate Kennedy talks about writing as osmosis, where the outside world seeps in: a ‘slow subtle seepage into metaphor and invention’. Writing, we make connections. Trace patterns. Tell stories. So it is, I want to introduce one more Pineapple Girl, the ‘angel at the centre of this rind’ to borrow again from Wallace Stevens. 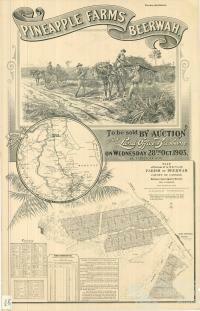 I found her, captured, at John Nicholson’s farm at Grovely, outside Brisbane. Here, in this composition, she’s writing herself into existence with silver gelatin from nearly 150 years ago. Just look at the shape and line this Pineapple Girl makes with her body and skirt, her fancy pineapple crown, and something of a curl across the moon of her countenance. She suggests a way to live—making up story as she goes—ignites our imagination, offers a future. She emits light through the phosphorescence, plants a crowd of flowers in us all, and gives breath a chance.